The Stone Hedge is a two-level unique character house that is surrounded by a 6 1/2 foot stone wall and a 25 foot cedar hedge — thus the name "The Stone Hedge". It is nestled in a quiet residential area, in a desired location in Richmond. Richmond is the Island City, By Nature and only minutes away from downtown Vancouver. The property is electronically gated and secure for our guests and their cars. Perfect for a Romantic Getaway. This original 1894 Heritage Log House is located on beautiful Galiano Island in the heart of the Canadian Southern Gulf Islands, British Columbia. The Captain's Quarters is an 800 sq ft two-storey hand hewn log house, lovingly restored using teak, red & yellow cedar and old growth fir logs. 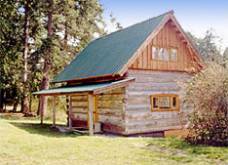 The cabin faces southwest and is flanked by a tall cedar grove on 10 rural acres. Secluded, private and self-contained. Romantic old fashioned claw-foot bathtub. Superbly handcrafted yellow cedar windows and decor. Warm and inviting!